You can figure this out by looking at the Friedmann equation, which relates the Hubble parameter to the energy density and the spatial curvature of the universe. The radius of our observable universe is basically the Hubble length, which is the speed of light divided by the Hubble parameter. It’s a straightforward exercise to calculate the amount of mass inside a sphere whose radius is the Hubble length (M = 4π c3H-3/3), and then calculate the corresponding Schwarzschild radius (R = 2GM/c2). You will find that the radius equals the Hubble length, if the universe is spatially flat. Voila! We don’t know from what the Big Bang sprung or what lies outside the observable universe. We cannot know these things because we have absolutely no information from before the Big Bang or outside the observable universe. One can make guesses. One can have interesting ideas. But one can’t know. Making such statements of certainty, as quoted above, limits and warps our ability to think accurately about the possibilities. Nicely put. In what ways is a de Sitter horizon similar or dissimilar to a black hole horizon? Patrick– true enough, I was implicitly assuming that the universe is described by a Friedmann-Robertson-Walker cosmology. That’s an excellent approximation for the observable universe. George– the similarities are sometimes overstated. The BH horizon is a feature of the spacetime, once and for all; the de Sitter horizon is different for each observer. Tod– you can do whatever integral you like, since the point is that the universe won’t really collapse to a singularity. There is a singularity in the past, and in the past dark energy was not very important. Since it is *currently* impossible to escape our universe it is reasonable to suspect that it is a black hole. I should clarify about de Sitter horizons — if the universe is dominated by a permanent vacuum energy (which is plausible), there are “places outside that we can’t reach,” since they are accelerating away from us. This would be true even in a perfectly empty universe, which doesn’t really resemble a black hole. But more importantly, those places are different for every observer; there is not one “interior” region and the rest “exterior,” which is why it’s not very black-hole like. Of course if you insist on calling it that, go ahead; it’s a free country. Hold on, I was under the assumption that the claims made about the universe being a black hole are generally made with regards to the observable universe, not the universe as a whole. That would certainly leave plenty of the rest of the universe to escape to, no? As far as I know, nobody considers the observable universe to be the whole universe. 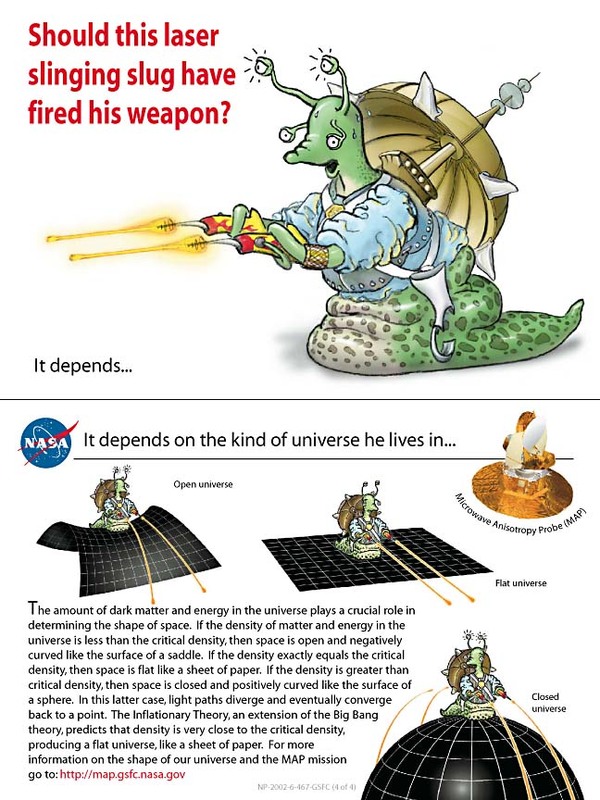 Also, is it not true that a photon fired from earth would indeed never be able to escape the observable universe? As it is moving away from earth at c, it would forever remain observable to us, so you can indeed never escape the observable universe, much like a black hole. To me it seems the biggest difference between the observable universe and a black hole is that it lacks a singularity, and because of that, it lacks a common event horizon for all observers. “a region of space from which nothing, including light, can escape” sure sounds like our universe. I didn’t think I was in a black hole before, but I sure do now! If there were an outside, we might see matter falling into our universe or gravity from outside having an effect inside. Sounds like a research program to me. Now answer a harder question: what makes a perfectly good physicist go crazy late in life? And–more importantly–how do we make sure it doesn’t happen to us? As I understand, the interior of a Schwarzschild black hole as a spacetime does have Big Bang and Big Crunch, hence both expanding and contracting phases, see http://arxiv.org/PS_cache/arxiv/pdf/0804/0804.3619v2.pdf p.5-6. However, the ‘space’ inside is anisotropic with topology of a cylinder. So it definitely looks nothing like our universe. Interestingly enough, it has neither a center, no a singularity. The singularities are in the past and future of any observer (Big Bang and Big Crunch). The weirdest thing though is that the ‘outside’ consists of two causally disconnected regions and the black hole serves as a wormhole between them. An observer from one can only see the other after crossing the horizon, with no hope of return. Working directly from wikipedia’s definition that a black hole is a region from which “nothing can escape” the universe (if there is nothing outside it) is in fact a region from which nothing can escape. It is an example where the precise statement matters, at least if talking with mathematicans (sort of like [0,1) has a supremum and an upper bound, but no maximum value). The statement “nothing can escape” does not imply the existence of somewhere to escape to; the reason that someone could not escape is that there is nowhere to escape to! – Is a global definition and not a local one. 1) That our universe is asymptotically simple. In this case there is a future null infinity in the completion and some null rays will reach it. Therefore there are points in the universe not contained within a black hole. 2) We cannot describe future null infinity, and so our definition does not apply to this class of spacetimes. In this post you have (at least in my opinion) misapplied the colloquial definition from wikipedia as well as argued why the universe should not be classified as a black hole. I hope this does not come off as harsh – I think fundamentally we don’t have any disagreement. It is just a personal preference if we start from a definition we apply it strictly, or we collect ideas to try and give us an idea of what a useful definition of a category should include. I see many arguments in religion and politics where people try doing both at once, and usually because they want to redefine something to be what they want, but carry all the emotional baggage the term already carries so they won’t let us know explicitly they are changing the definition. Thanks for the postings, and I agree that the white hole example is a useful one. The radius of the observable universe is actually somewhat larger than the Hubble length. The Hubble length is 13.8 billion light years, but the observable universe has radius 46.5 billion light years. The reason for the difference has to do with the fact that the Hubble distance increases over time at the speed of light. Thus, even if light starts out beyond the Hubble distance, it can eventually catch up to us. But it’s only a factor of about three, so in physics-speak, they’re “basically” the same, as Sean said. I’m pretty sure I read an essay by Asimov some years ago that made that very claim. I blame him. That’s not really a good answer; the Big Bang and black hole singularities are both spacelike. I.e. the Big Bang extends through all space at a single instant, and the black hole singularity extends through part of space at a single instant. Why is calculating the mass of the universe straightforward? Doesn’t this require observation of galaxies, dark matter estimation, a decent length scale, etc? Correct me if I’m wrong, but doesn’t the maximally extended Schwarzschild solution have two completely disconnected regions of spacetime that both have the white hole in their past? So if the FRW solution looks like a white hole, couldn’t this other region constitute an “outside” of our universe? The gravitational field of a black hole, unlike other characteristics of it contents, extends beyond its horizon, and its effects are ‘easily’ observed. Could not very concentrated and ‘large’ masses ‘beyond’ our cosmic horizon be observed by their effects on our side of the horizon – as accelerations away from us – ‘indistinguishable’ from dark energy? Wouldn’t that also be ‘required’, if our universe were a black hole? Sean: “Note that a spatially flat universe remains spatially flat forever”. Not if we can convert enough matter, (1+z)^3, into energy, (1+z)^4! Woohoo! The Universe is certainly not a black hole. But there does seem to be some connection between global geometry of a given Hubble volume and its entropy content. Inflation enforces the condition of a saturated entropy bound for every Hubble volume of spacetime. Based on this we can understand why the vacuum energy density takes the value it does based on matter density. Of course we don’t know what the mechanism is that gives us Dark Energy. But if gravity is really emergent, a kind of entropic force , as Verlinde has suggested, thinking this way might be helpful. I don’t think this is nonsense but it’s uncertain if it leads anywhere useful. [a] Thinking that one can understand GR without studying it and thinking hard about it for many years. [b] A timely retirement, and a vow not to publish anything thereafter. Oh dear. I’m afraid I would flunk a student who made an error that flagrant. And he doesn’t even have the excuse of being a particle theorist. Thx to Sean for the post and to Sergiy Koshkin for the interesting link. Sorry for stubbornly insisting, but are you sure? Let me explain the question: ok a spatially flat observable universe has the density of a black hole. But is it as obvious that having the density of a black hole means being a flat universe*? Let’s consider a flat universe in which a comsological constant is introduced**: obviously the horizon will come closer in the long run, so one should expect the density to become lower. However, it seems also logical to interpret the cosmological constant as an extra energy. So maybe the density shoud be higher for what it matters. Is it possible that the net effect is zero? * of course one may be a black hole instead of an universe. It’s a free country. Sean, do cosmologists believe there is anything outside the observable universe or not? Your previous posts have lead me to think the answer is yes, but this one makes it seem the answer is no. The fact that our Universe is flat rest on three points. It has the correct energy density to be flat based on surveys and SN1A data, the basic idea that an inflation event launched the expansion of the Universe requires a flat Universe (within our cosmic Horizon) and careful analysis of the Cosmic Microwave Background (CMB) indicate a spatially flat Universe to a high degree of certainty. Big difference when you’re in the hole, I guess. But if I assume that the arrow of time is meaningless anyway, where does that lead? To just two equally valid ways of looking at time-asymmetric “holes” of a certain kind? If we take a black hole and “run it backwards”, what would that look like from the inside? Hmm. I’m not a fan of “time-reversed” black holes, unless you’re a time traveler. I’d rather people called them white holes and be done with it. Time marches forward. This will be slightly off topic, I apologize, but since it relates to postdoctoral researchers at UC, I’m guessing it will be useful information for some of the readers. The labor union UAW is trying to establish a postdoc union at UC, but some postdocs are not happy because of what they see as fraudulent behavior on the part of union reps in collecting authorization cards. Basically, they say many postdocs were tricked (by lying, etc) into signing cards, without knowing what they are doing. Now a decertification effort is under way at http://ucpostdocs.wordpress.com/ Even if you are supporting the union, it’s worthwhile to check it out. I have been saying this for a long time. I said it in grade school, but no one listened. I said it in Middle school, ignored. I said it in high school, and I got lectured by Mrs. Murphy. The universe is a black hole, everyone says. Well stop getting your science from Flash Gordon comic books. I’m glad people are finally willing to listen. Sean sez: …”the de Sitter horizon is different for each observer”. I thought the CC was a Lorentz invariant quantity ? Seems like they should all agree. Apart from size, how else can one differentiate horizons ? The horizon radius is the same for all observers, but the location of the horizon is not. That is what Sean meant. If I am slightly to the left of you, my horizon will be slightly to the left of your horizon. “Time reversed” doesn’t have anything to do with time travel, system A can be said to be a time-reversed version of system B (and vice versa) if a movie of system A’s behavior evolving forward in time, when played backwards, would look just like a movie of system B’s behavior evolving forward in time. For any system A that obeys time-symmetric laws (such as general relativity), the laws of physics should permit such a system B whose forward evolution looks just like a backwards version of A, though due to the thermodynamic arrow of time system B might be terrifically unlikely. So the universe is not a black hole? This sounds like an argument over definition. 1) I give quite a few public talks on cosmology, and the issue of a universe being infinite is a constant source of confusion. I try and explain that if it is infinite now, then it was always infinite, right from birth, and that the divergence is in the density of “stuff”. They counter with the fact that someone told them the universe used to be the size of a beach ball, and then discussions of the difference between the universe and observable universe ensure. I hope that by the end of it all I have showed them what modern cosmology is about, but I might also just leave them with the idea that cosmologists are nutters. Actually – it doesn’t. *You* have the choice to define which direction proper-time increases along a world-line – this is the part students hate. A black hole has no hair. Some mass outside our Hubble horizon is pulling galactic clusters in its direction, and masses near our horizon are undoubtedly affecting masses beyond it. My horizon is slightly different from yours. A BH has only one or two distinct horizons. What do you think about the following argument. Suppose our universe was a black hole. Then it would have a singularity. This singularity would be a “preferred” region of space and thus violate the Cosmological principal. Therefore our universe is not a black hole. Immediately clear, & thanx ! Can you tell me what SHAPE our universe is? “Spatially flat” means that the geometry of space matches 3D Euclidean geometry: a pair of straight lines can have a constant distance between them if they’re parallel, the angles of the corners of a triangle always add up to 180 degrees, etc. If the universe had positive spatial curvature, it would be the 3D analogue of the curved 2D surface of a sphere (the 2D analogy is helpful since we can’t actually visualize a curved 3D surface), where “straight” paths (in the sense that they are the paths with the shortest possible distance between any two points they cross, i.e. great circles) will always cross at two different points, and the angles of a triangle made out of straight paths will add up to more than 180 degrees (see the diagram of triangles on different surfaces here). Finally, negative spatial curvature would be the 3D analogue of the curved 2D surface of a saddle shape, where “straight” paths that started off parallel would diverge, and the angles of a triangle would add up to less than 180 degrees (again see the previous link). For some 2D diagrams of surfaces with positive, negative, and flat curvature, see this image from the WMAP FAQ along with this one, and maybe the top one from part 3 of Ned Wright’s cosmology tutorial. It seems clear that the universe is not a black hole, but could there be a black hole a the center of the universe? The universe isn’t thought to have a center according to the most popular model of an expanding universe. See here for more. I’m curious what Sean thinks about the possibility of the “Big Crunch.” Does it violate his ideas about increasing entropy? My understanding as an undergraduate was that current evidence points away from the big crunch, but that there was enough uncertainty in the data that it couldn’t be rejected outright. >That insight, plus four dollars or so, will get you a grande latte at Starbucks. And thanks for that little calculation with Friedmann. For those of us who have not studied general relativity (but who do know what a manifold is..etc) these things are very exciting. >Note that a spatially flat universe remains spatially flat forever.. So the universe as a whole is spatially flat, but small parts of it are not? >> So the universe as a whole is spatially flat, but small parts of it are not? The universe is flat in an average* sense. * note that the notion of average is very poorly defined in this context. your reasoning is backwards. there is no “outside”, therefore nothing can escape, therefore the universe IS a black hole. the fact the behavior doesn’t conform to what you “might expect the interior of a black hole to be” means your expectations are wrong, nothing else. Reasoning is not the issue – the Universe is *mathematically* not like a black hole (in general) – only some universe have a future finite conformal horizon which means there are parts of the existing universe which we can never visit. @ 51: Thanks. I know, I was specifically asking about this “on average” statement. How does one determine in physics whether something is “on average” homogenous? Particularly when subsets of that space appear to be exceedingly non-homogenous? There does not seem to be a straightforward way in either physics (or biology) to talk about irregularities found in nature. Computer scientists are little better off because they can start off from a binary string right off the bat, based on rigid definitions of machines and their input and output. But in the real world, nobody has defined these things. Real systems work differently – the universe computes itself, so to speak. The machine and the tape are one. What I am trying to say is that before you make entropy calculations..etc, one has to determine how to achieve a universal method of description of the physics of a particular segment of space. Currently, their seems to be no such method. Kolmogorov complexity and related studies do no attempt to approach this problem. Like I said, they *assume* a solution to this problem, and start off from there, which is meaningless. Can someone please correct my logic. If “there was a singularity in our past” then we must still be within its event horizon. The Big Bang didn’t blast our proto-bits out beyond the Schwarzschild radius-that would be impossible, right? All the Big Bang could do was create new space but still within the horizon. If we are not on the inside of a BH how did the universe escape that primordial singularity? It was a different kind of singularity to the one you see at the centre of the schwarzschild black hole. The black hole is a singular point in space, the universe was singular everywhere (and if it is infinite, still everywhere infinitely so). if the big bang density was infinite, that sounds like a black hole to me. since you cant escape from it, we are still in that black hole. >> if the big bang density was infinite, that sounds like a black hole to me. While it sounds like the same thing to you, it isn’t – mathematically, they are different. Sean says, “it’s very similar to what we would expect from a white hole, which is just a time-reversed version of a black hole.” But that implies the stuff was inside a BH safely behind the horizon and then flew out beyond the horizon-the reverse of falling into the BH. Also it implies that there was a singularity and then the density was too small to cause a collapse, which would look like stuff flying out of the singularity to form a star. But these sound like impossible events and so the trick is in the phrase “very similar” and that is what I don’t understand. I confess that I have found very little written about this conundrum and would greatly appreciate a pointer. My question is best stated as, “what rules govern the state of the universe just after the Big Bang?” Was there great enough density to cause a BH collapse or not? I understand that the Big Bang singularity was in all space at once, not a single point in a greater space but how do you get around the density question? Was space expanding too fast to allow a collapse? If so then there is an interpretation of the collapse formula that I don’t understand. First, let me make it clear that I have no credentials and no idea what I’m talking about. But that’s no excuse for not having an opinion, is it? Seems to me that all of the arguments for “not a black hole” presume that we know what our measurements are actually telling us. But what do those measurements look like from an observer outside of the universe? Could it be that the dark energy is actually collapsing and if you look from this outside perspective, that our measurable universe ia actually static and not expanding? That somehow the measurements we make are merely seeing the differential between dark energy and the rest of it, and we assume that ours is the correct perspective, but in fact everything we assume is flawed because our Flat World tools simply cannot measure in enough dimensions for us to determine what is happening. >> But what do those measurements look like from an observer outside of the universe? Well, I have two things to say about all this: To think this all happened circumstantially is absurd. God is great; and the heavens prove so! If one allows black holes to be nested then there could be exterior and interior regions to a black hole universe. In fact, if our universe were a black hole, then there would indeed be nesting of black holes, since our universe certainly contains black holes. This possibility of nested black holes provides a mechanism for the multiverse – among all the multitude of nested black holes, some would have conditions which are not propitious to producing stars, galaxies and life, whereas some might, including our own.